C-terminal Synthetic peptide (Human) conjugated to KLH. Our Abpromise guarantee covers the use of ab12265 in the following tested applications. IHC-P: 1/100 - 1/500. Retrieve antigens Formic acid before commencing with IHC staining protocol. Functions as a cell surface receptor and performs physiological functions on the surface of neurons relevant to neurite growth, neuronal adhesion and axonogenesis. Involved in cell mobility and transcription regulation through protein-protein interactions. 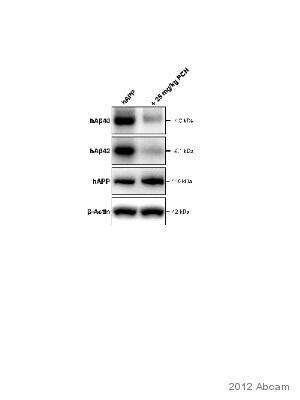 Can promote transcription activation through binding to APBB1-KAT5 and inhibits Notch signaling through interaction with Numb. Couples to apoptosis-inducing pathways such as those mediated by G(O) and JIP. Inhibits G(o) alpha ATPase activity (By similarity). Acts as a kinesin I membrane receptor, mediating the axonal transport of beta-secretase and presenilin 1. Involved in copper homeostasis/oxidative stress through copper ion reduction. In vitro, copper-metallated APP induces neuronal death directly or is potentiated through Cu(2+)-mediated low-density lipoprotein oxidation. Can regulate neurite outgrowth through binding to components of the extracellular matrix such as heparin and collagen I and IV. The splice isoforms that contain the BPTI domain possess protease inhibitor activity. Induces a AGER-dependent pathway that involves activation of p38 MAPK, resulting in internalization of amyloid-beta peptide and leading to mitochondrial dysfunction in cultured cortical neurons. Proteolytically processed under normal cellular conditions. Cleavage either by alpha-secretase, beta-secretase or theta-secretase leads to generation and extracellular release of soluble APP peptides, S-APP-alpha and S-APP-beta, and the retention of corresponding membrane-anchored C-terminal fragments, C80, C83 and C99. Subsequent processing of C80 and C83 by gamma-secretase yields P3 peptides. This is the major secretory pathway and is non-amyloidogenic. Alternatively, presenilin/nicastrin-mediated gamma-secretase processing of C99 releases the amyloid beta proteins, amyloid-beta 40 (Abeta40) and amyloid-beta 42 (Abeta42), major components of amyloid plaques, and the cytotoxic C-terminal fragments, gamma-CTF(50), gamma-CTF(57) and gamma-CTF(59). Membrane. Membrane > clathrin-coated pit. Cell surface protein that rapidly becomes internalized via clathrin-coated pits. During maturation, the immature APP (N-glycosylated in the endoplasmic reticulum) moves to the Golgi complex where complete maturation occurs (O-glycosylated and sulfated). After alpha-secretase cleavage, soluble APP is released into the extracellular space and the C-terminal is internalized to endosomes and lysosomes. Some APP accumulates in secretory transport vesicles leaving the late Golgi compartment and returns to the cell surface. Gamma-CTF(59) peptide is located to both the cytoplasm and nuclei of neurons. It can be translocated to the nucleus through association with APBB1 (Fe65). Beta-APP42 associates with FRPL1 at the cell surface and the complex is then rapidly internalized. APP sorts to the basolateral surface in epithelial cells. During neuronal differentiation, the Thr-743 phosphorylated form is located mainly in growth cones, moderately in neurites and sparingly in the cell body. Casein kinase phosphorylation can occur either at the cell surface or within a post-Golgi compartment. Publishing research using ab12265? Please let us know so that we can cite the reference in this datasheet.